Have You Spotted the Little Green Dots? The next time you Grab a ride from Glorietta, look for the little green dots that let you choose exactly where you want to be picked up. Gone are the days of having to type in “Notes” or call the driver to say whether you’re at Hotel Drive Entrance at Glorietta 1 or Mercury Drug at Glorietta 4. There are even useful descriptions like “opposite Rustan’s” to help you identify the specific pick-up point. Typically, map providers place location markers right in the middle of buildings and places. These are useful for navigating from A to B but can be confusing for drivers trying to pick up or drop off passengers. Airports, shopping centres, train stations and tourist attractions are especially challenging. Compounded by high traffic and multiple entrances, these places become a pick-up roulette for drivers and passengers trying to find one another. Through local data collection and analysis, our map operations team has rolled out more than 5,000 new, precise pick-up points across the region. The green dots on your app show the different pick-up points in these busy locations, and you can even toggle between them to choose the most convenient. Lorenz Lao, who works in a bank, used to have difficulties getting picked up from the Mercury Drug entrance at Glorietta because of the multiple exits. “Now that the pick-up points are so accurate, the rides are faster and more efficient. There’s no wasted time,” he added. In fact, it’s been so quick and reliable to travel around with Grab that Lorenz has stopped driving. He uses Grab at least twice a day and even more on weekends for all his transport needs. Ultimately our goal is to provide you with seamless point-to-point travel. If you have to walk from your selected pick-up point to where the car is, the distance walked is what we call a “rendezvous distance”. To reduce such rendezvous distances, we first identify the most challenging regions (see shaded areas on interactive map below) by crunching huge amounts of data and analysing location-related feedback from passengers and drivers. We first look up locations online to pinpoint where the best pick-up points might be, followed by visiting each location to corroborate what has been discovered. We talk to locals to get their feedback and assess if the pick-up point is feasible for different vehicle types, making sure it’s compliant with local regulations. For example, taxi stands in shopping malls may be accessible only to taxis but not private cars. With more accurate pick-up points, the driver can pull up precisely to where you are waiting. Drivers are now less stressed in trying to locate passengers, who are also less likely to cancel out of frustration. And this convenience is being felt across the region, where, on average, you can get to your car within 40 metres. In Philippines, most passengers are now able to get to the car within 25 metres. 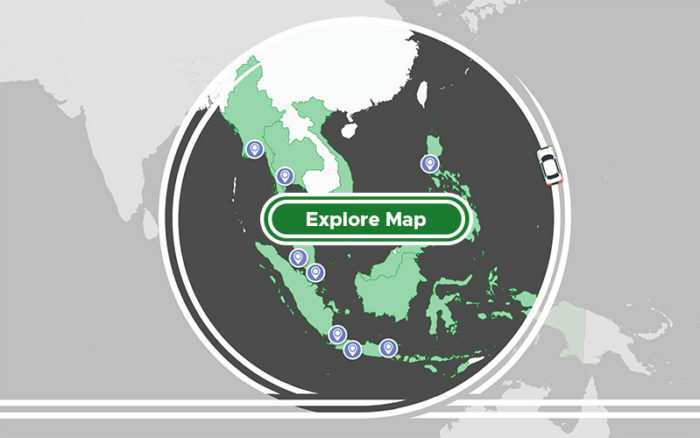 Have a drive around this interactive map to see some of our new pick-up points across Southeast Asia. Please view on desktop for the full interactive experience. “We want to create the best ride-hailing experience for our customers in Southeast Asia. It’s crucial that our passengers get picked up and dropped off at the specific point they’ve indicated,” said Ajay Bulusu, Grab’s Regional Head, Map Operations. “We’ve made great progress, and we’re scaling rapidly to improve the accuracy of all pick-ups and drop-offs. Passengers can now enjoy the ease and convenience of being picked up at the exact airport terminal door or a particular point in a large industrial park or shopping mall. As we work to make our pick-up and drop-off points even more precise, we’re also taking swift action on locations that might have been inaccurately pinned. To do so, we are fortunate to have the Grab community as our eyes on the road to inform us of any blind spots. That is why we’ve made it easier for you to provide feedback. When Lorenz wanted to let us know that the pick-up point for his house was pinned incorrectly, it took just three taps to get to ‘Report Location Issue’ in the app. Passengers can select specific location issues to give feedback on, such as ‘incorrect route or entrance’ or ‘missing address, name or pick-up/drop-off location’. Despite Lorenz entering the correct street and building, whenever a driver try to pick him up, the driver always end up in the wrong street. Across the region, feedback from riders like Lorenz has been crucial in helping us build a map meant for ride-hailing. Between last October and January this year, we delivered almost 2,000 map updates for passengers based on their feedback on locations. With the ‘Driver Rate Trip’ in-app feature, drivers can also instantly submit feedback on location issues, which gets pushed directly to our engineering and operations team for immediate action. Within four months of launching this feature, we acted on more than 50,000 location-related feedback responses from our drivers in the region. They told us about restricted pick-up or drop-off points, closed roads, and even undocumented back alleys! “A lot remains to be done to map the whole of Southeast Asia for ride-hailing, and we are definitely getting there with active feedback from our drivers and passengers. We can achieve this together as a community, if everyone helps everyone,” said Ajay. While it may seem like we are not addressing your comments instantly, we assure you that every piece of feedback from you is helping us build a better and happier ride-hailing experience in Southeast Asia.